This photo is from the Piskaryovskoye Memorial Cemetery in St. Petersburg, the memorial dedicated to the victims of the Siege of Leningrad, during WWII. According to Wikipedia about 420,000 civilians and 50,000 soldiers of the Leningrad Front are buried her in 186 mass graves. Near the entrance a marble plate affirms that from September 4, 1941, to January 22, 1944, 107,158 air bombs were dropped on the city, 148,478 shells were fired, 16,744 men died, 33,782 were wounded and 641,803 died of starvation. In here I found this old lady, she was sitting and reading a story out loud. 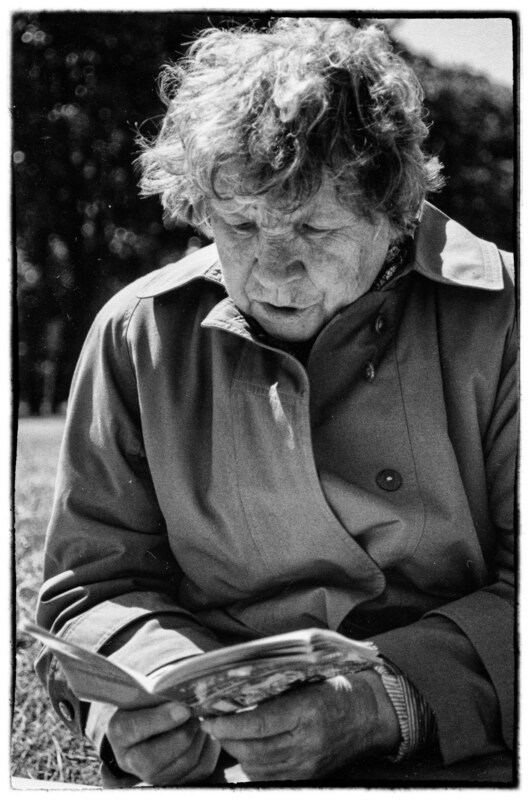 I asked if I could make a photo of her – by pointing at my camera, because I don’t speak Russian and she spoke no English – She nodded and kept on reading, after I had made a few photos I sat down next to her and listening to her quiet voice as she read her story. After a few minutes I got up and started to walk away, she looked up at me for a second gave me a friendly smile before she returned to her story. Every time I look at this photo, I always wonder who the story was for? her dead husband or brother, all the dead souls in the cemetery or maybe she was just a lonely person who didn’t have anything else to do. anyway, in the end, It doesn’t really matter, because those few minutes I spend with her, I like to think that the story was for me. The photo was made with my Nikon F70, I do not remember which lens I used at the time, but it was properly a 50mm f:2.0.